One of the most dynamic and fastest growing sectors in the Philippines that needs to operate 24/7 is the Business Process Outsourcing (BPO) industry. It plays a major role in the country’s growth and development. This industry is composed of eight sub-sectors, and one of them is the call center. It is also the largest sub-sector in the Philippine BPO industry. Since call centers operate 24/7, they also have been a major subject on some commonly identified health problems and working conditions. A case study conducted for call centers shows the most common employee complaints were back and shoulder pains due to the workstation setups and monitor levels, throat irritations due to dealing with multiple calls a day coupled with a high stress work environment and eyes irritation due to dealing with the sunlight striking the monitor. Purchasing the right furniture design, painting the right color and choosing a functional blinds can help to transform and alleviate stressful office setup into a comfortable and relaxed workstation. It can also influence and increase the employees productivity. Doing some simple interior setup and rearrangement will lessen employee health problems. 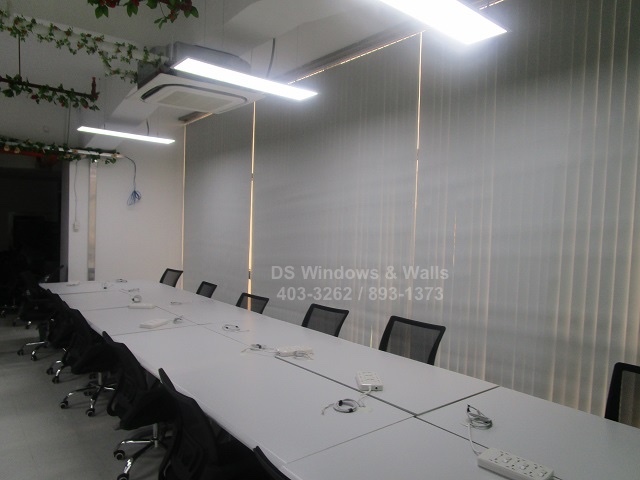 Like this call center company along Ayala avenue, Makati City, which is our featured client for this article, who renovated their working station and decided to install a functional Fabric Vertical Blinds to make their employee feel more comfortable and less distracted by heat and sunlight. Fabric Vertical Blinds is one of the stylish blinds nowadays that is very well suitable for large and long windows. It has a tilt wands and pull chains that can help to control the amount of sunlight that penetrates the room and makes the night shift employees still enjoy their work until the sun comes out. Fabric vertical blinds also offer a softer look than PVC vertical blinds. Being lighter in weight makes it more easy and quiet to operate. It’s versatile, durable and high fashion fits to any kind of room space, whether it is in home or office. You will never get wrong with Fabric Vertical Blinds, its affordability yet functional features makes more clients choose to have it. 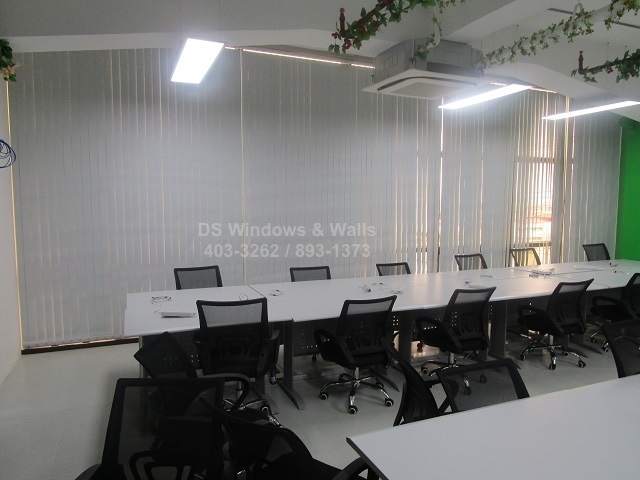 DS Windows & Walls is one of the leading company that offers a wide array of fabrics and colors of Fabric Vertical Blinds and other kind of blinds. 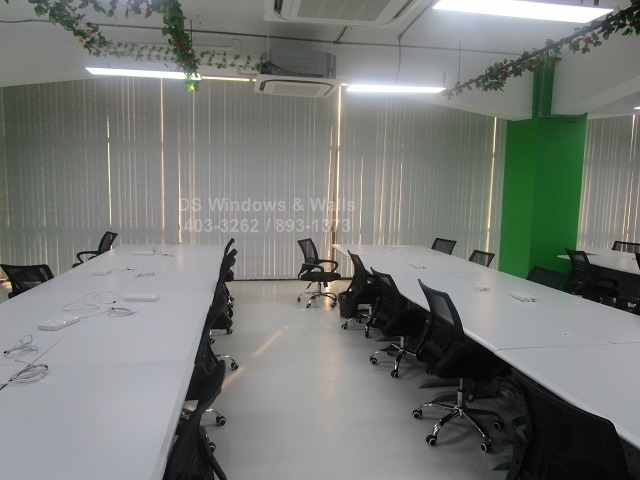 For further inquiries, you may call us at (02) 403-3262 / (02) 893-1373 / 0916-31-3909 or e-mail us at inquiry@dswindows.com. You can also visit our showrooms located at 4th Level Waltermart, Makati City, 3rd Level Robinsons Metro East, Pasig City and 2nd Level Pacific Mall, Lucena City. For CALABARZON area, you may contact Mr. Patrick Villapando at (Globe) 0917-583-0214 or (Sun) 0922-592-6111 or (Smart) 0908-989-4676. "Keep your dreams alive. Understand to achieve anything requires faith and belief in yourself, vision, hard work, determination, and dedication. Remember all things are possible for those who believe"